Capturing, recording, arranging and editing. From soundtracks and sound effects, to studio sessions and live events, throughout this course you will learn to create, record, mix and manipulate audio, for all of these scenarios and more. Whether it’s sound for film, TV, games or radio that you see yourself working with, Spirit Studios will help you become confident in creating, mixing and mastering audio to industry standards, and applying it across a range of different media. Covering everything from Foley and field recording, to synthesis and voice overs, this course also gives you the opportunity to get out into the industry, working for external companies, meeting professional briefs and deadlines, and begin building a name for yourself as an engineer. Alongside practical sessions with our expert tutors, you will have extensive access to professional studios in your own time, giving you every opportunity to perfect your knowledge of acoustics and key audio principles and techniques, alongside the entrepreneurial skills you will need to create a long-lasting career in audio. Introducing you to key aspects of studio recording and psychoacoustics, you will gain a practical understanding of signal flow and gain staging, alongside characteristics of sound such as waveform, phase and harmonics. This knowledge of how sound behaves in a studio environment, as well the effect caused by various aspects of the recording chain, will be applicable to all other modules, giving you a strong base of knowledge from the very start. Combining practical sessions with recording theory, you will develop knowledge of microphone placement and techniques, while starting to build up your skills in recording and overdubbing, using a range of studio hardware and software. You will then put these skills to the test when you invite a band into the studio and engineer your first session in our studios. Using industry standard DAW’s, you will create compositions using a wide range of software instruments, loops and DSP effects, while also generating customised audio and MIDI configurations. Sessions will focus on MIDI and audio recording, editing and arrangement techniques and automation, alongside in-depth sessions on workflows which can then be applied to large studio environments. Providing you with in-depth knowledge of mixing techniques and procedures, you will be introduced to the use of dynamic controllers, EQ and time delay effects, while also developing your critical listening skills as an engineer. Through this module, you will learn to apply this knowledge in a practical studio environment, and gain industry recognized Pro Tools 101 certification. Introducing you to the principles of sound design and production for use across various visual media, you will use industry standard software to plan, record and prepare sound for film, TV and games, gaining a clear understanding of the workflows involved. You will then work to process and deliver audio content in a number of file formats, gaining practical experience working with the techniques and encoding formats required for different media. Focusing on key academic requirements and study skills, you will develop your professional writing and presentation skills, demonstrating appropriate subject knowledge and research, while producing a personal development plan and portfolio of work, helping you to progress your skills across a range of relevant areas. Introducing you to some of our more advanced studios, you will learn to use digital control surfaces alongside advanced analogue mixing consoles. Developing your skills in recording and mixing to a professional standard, you will learn advanced microphone and processing techniques for the correction, manipulation and enhancement of your audio projects. Providing you with video files to work with during sessions, you will be mixing and repairing the accompanying audio, while recording appropriate voice-overs, sound effects, Foley and atmosphere, and creating soundscapes to complement the video. 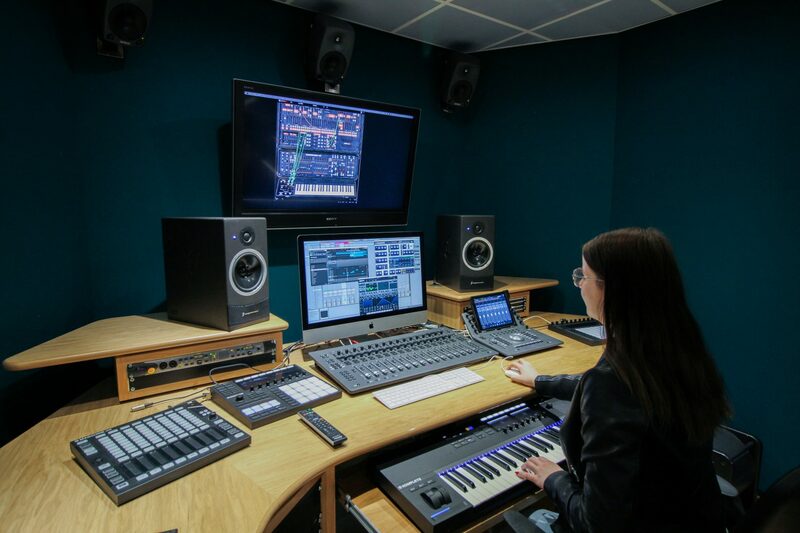 You will also gain an introduction to the technologies and workflows of audio post-production through both research into industry practice and practical sessions in the studios. Introducing you to the roles and responsibilities within live sound, from monitor and front of house engineering (FOH), to stage management and artist liaison, you will work as part of a team to produce a live show and operate all equipment within our on-site live venue. With sessions covering PA system components, technical specifications and audio processing in a FOH mix, you will gain practical experience working as a live sound engineer in a professional setting. Examining various methods of sound synthesis and manipulation to convey mood and atmosphere within your work, you will put your technical skills to the test by creating an original composition to accompany a piece of film. Through the study of film audio and soundtracks, you will analyse creative compositional techniques which you can then adapt and apply to your work and personal projects. By further exploring psychoacoustics, you will capture and record sounds and reverberant fields in a variety of spaces, to understand the impact of environment on recordings and sound perception. You will also gain an understanding of sound design and Foley processes within this context, using industry-standard software and equipment, allowing you to apply this to larger professional projects when you graduate. Applying the skills and knowledge you have gained throughout your study, working either with an employer or on a freelance basis, you will secure a work placement or project in a relevant field. Sessions will help to prepare you for taking on professional industry work, and explore different roles and structures within organisations, allowing you to put your practical study into a wider context. Examining both traditional and modern mastering techniques and technologies, for a range of media, this module will help to develop your skills in compression and EQ, controlling dynamic range to a professional standard. You will also build up creative and technical skills in the compilation, editing and ordering of audio for commercial purposes, working towards a professionally mastered project. Building on your skills in audio post production, you will use real industry examples to mix audio for video to strict broadcasting standards. Throughout this module you will gain advanced skills in audio repair and replacement, as well as mixing to mono, stereo and 5.1 surround sound formats. Sessions will also cover effective playback and tracklay techniques alongside ADR, Foley, field recording, and audio synchronisation for a range of visual media. Building on your knowledge of PA systems, you will research into current PA system design trends to work towards designing one of your own for an event of your choice, while considering a number of factors that affect the resulting sound. From acoustics, frequency balance and environmental factors, to client specifics such as noise sensitivity and audience coverage, you will learn to design professional PAs, effectively using spectrum analysis to inform your decisions. Developing your awareness of key market trends and factors affecting freelance careers in audio engineering, through market research you will explore a specific sector of the industry, relevant to your professional goals. Through this study, you will gain key practical self-employment knowledge in business strategy and planning, promotion, legalities, financial planning and more, while also developing a career plan informed by your work across your degree study. Centred around you and your creative goals, this module will give you the freedom to plan and produce a project, relevant to the audio industry. Making use of knowledge and skills gained throughout your course, this will be your most substantial piece of work, and will allow you to develop a professional portfolio within a specialist field that really shows what you can do. A minimum of 104 UCAS points at A2 or equivalent including a mathematical, physical science or technology based subject or music. You should also have achieved 5 GCSE passes at Grade C or above, including Maths and English. You will also be invited to an interview, with subject experience and enthusiasm the primary basis on which applicants will be selected.